India Online Invitation, Free Online Invitations, India Evite for Wedding, Birthday Party etc. 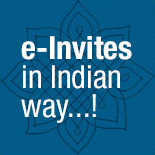 Sending invitations and managing RSVPs for Indian parties and events are now easier than ever before! Yoovite is the #1 tool to create invitations for Indian Parties and Events. Whether it's Birthday, Housewarming or Wedding, we have 100's of invitation designs with so many Indian themes to choose from. Creating an e-invitation with Yoovite is as easy as 123...! 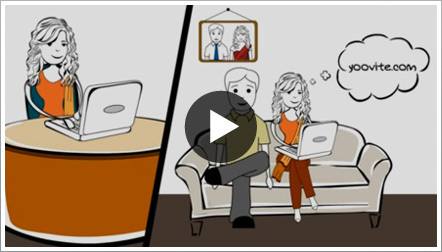 Watch the video to find out more about Yoovite. Now order a personalized e-Invitation from Yoovite! Are you looking for a customized e-invitation card for your next party? Now, buy online invitations exclusively designed for any life event like Engagement, Wedding, Housewarming, Kid's birthday or anything else from Yoovite. Make a totally personalized e-invitation card with your photos, ideas, colors, background and font choices. Available at an affordable price, starting from just Rs.500! when someone send you an Yoovite invitation!